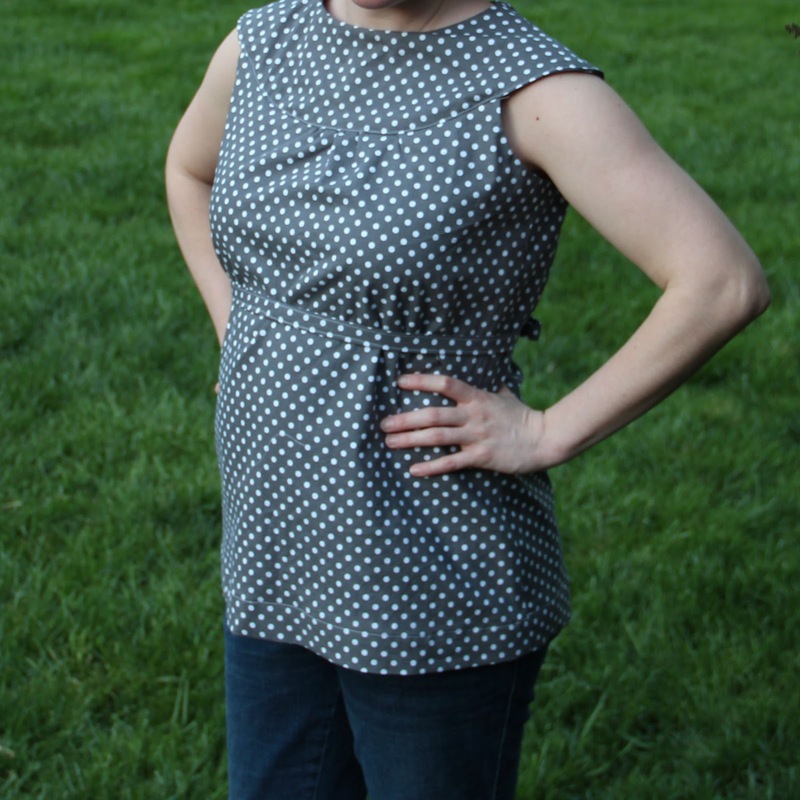 I actually finished my Anna Tunic, took some photos, and entered it in the Spring Top Sew Along at Made-by-Rae. But, better late than never. And I'm proud that I got it done in time to join up with the sew along. Here she is--and still fitting over my growing belly. Thankfully! I had a little trouble attaching the yoke to the bodice. That also stalled my progress for a bit because I would get frustrated trying to figure it out. Overall, I felt that the pattern and instructions were easy to follow. But, sometimes you just have to ignore the instructions and do what makes sense to you. I'm pleased with how it turned out. Although when I make this again, I am going to choose a much lighter lining fabric. 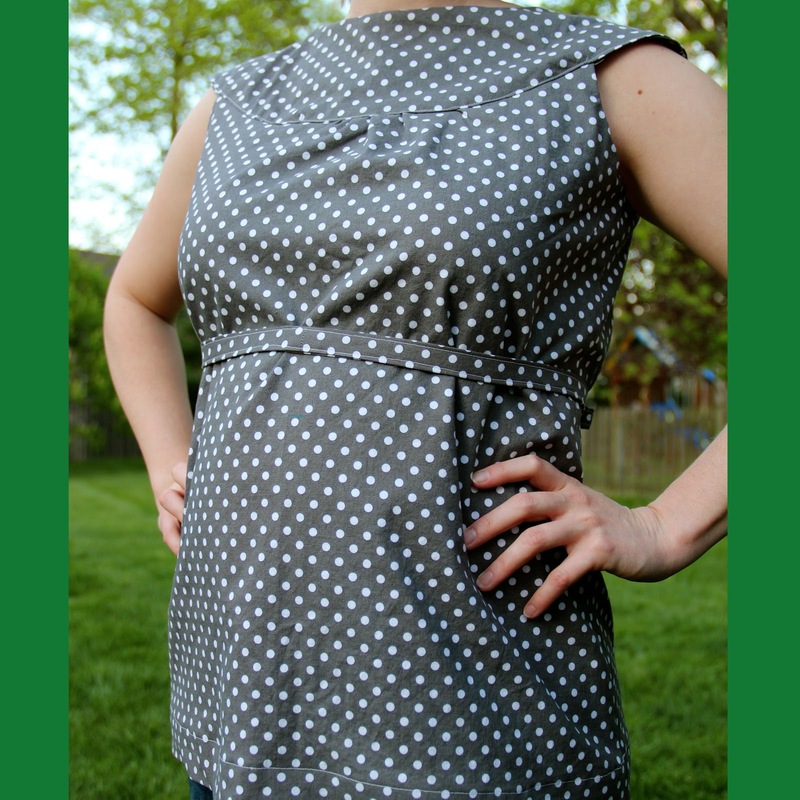 The quilting cotton plus a substantial lining makes this a pretty thick and heavy shirt. Too heavy for my tastes--although it is camouflaging my baby bump pretty well in these pictures (maybe not such a good thing as it may just make me look larger than normal and not 6 months pregnant). So, thumbs up to another Amy Butler pattern. And next time I will choose lighter weight fabrics to make for a better draping top. You can see some progress on this top here and here. Now that I've sewn something for me, it's on to baby projects! Megan, it looks great, cute style. You did a good job, I'm proud of you. I used to sew so much but have gotten away from it, maybe I should look into it again since I can't find anything in the stores that fits me right. PS...does this really need a lining? They yoke maybe but I don't think the body would. Thanks for the encouragement! You're probably right--I bet I could do it with no lining. That was just what the pattern called for so I did it.